REN pioneered the concept of Clean Bio Active Skincare. Skincare that uses the latest, clinically proven actives, is free from skin-unfriendly synthetic ingredients and is gorgeously pleasurable to use. REN boosts the skin’s natural ability to protect, repiar and renew itself leaving skin beautifully healthy and radiant. 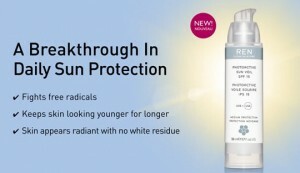 Not just a chemical free sunscreen, it also incorporates an anti ageing active, to firm and revitalize the skin….